These companies in the Berkshire Hathaway portfolio look attractive today, as does Berkshire Hathaway itself. One investing style that some like to use is to follow the lead of great investors. For those looking to buy and hold stocks, there is probably no better investor in whose steps you should follow than Warren Buffett. The returns at Berkshire Hathaway (NYSE:BRK-A) (NYSE:BRK-B) have been undeniably great, and much of that has to do with Buffett's ability to sniff out great stocks. So we asked three of our Motley Fool contributors to sift through Berkshire's portfolio of stocks and come up with three picks worth buying today. Here's why two of them picked Store Capital (NYSE:STOR) and Synchrony Financial (NYSE:SYF) while one argued that you might be better off just buying Berkshire Hathaway itself. Neha Chamaria (Store Capital): In the middle of last year, Berkshire Hathaway added another industry to its portfolio -- real estate -- when it bought shares in real estate investment trust (REIT) Store Capital. It is the only real estate stock Berkshire currently owns, but that's not what caught my attention. Rather the company's growth potential did. Store Capital owns and leases more than 2,000 properties (mostly single-tenant) to nearly 400 tenants across 105 industries. They're primarily in retail, service-oriented industries such as restaurants, furniture stores, health clubs, and movie theaters. A diversified portfolio like this one can weather the storms better than a niche portfolio. To top that, Store Capital enjoys a double-dip advantage as a net-lease REIT: Its leases are really long term (average lease term is around 14 years) with inbuilt rent escalators, or annual rent increase clauses, and property-related variable expenses such as maintenance, property tax, and insurance are borne by the tenants. In short, by its very nature, a net-lease REIT can earn stable income that also grows with time. In its most recent quarter, Store Capital reported an occupancy rate of 99.7%, 15% growth in revenue, and 19% jump in adjusted funds from operations (AFFO). The company expects to earn $1.78-$1.84 in AFFO per share in 2018, representing 6% upside at the midpoint from 2017. Since its listing in 2014, Store Capital has grown its AFFO and dividends per share at a healthy clip, with the stock currently yielding 4.3%. So yes, with Store Capital, you can also expect sustainable and growing dividends, backed by the rent escalators in its leases that provide a solid base for AFFO growth. That should keep up the stock's momentum. 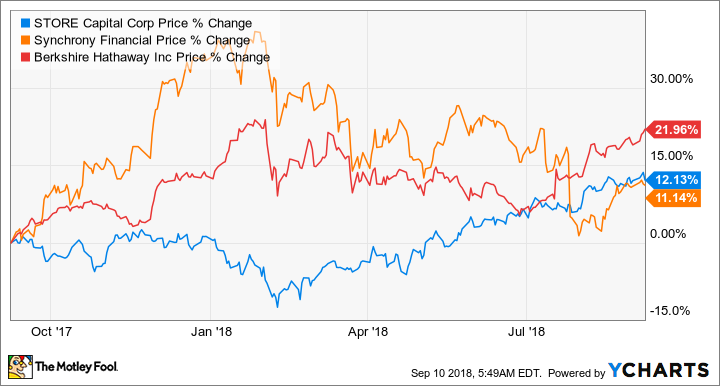 Matthew Frankel, CFP (Synchrony Financial): There are several bank stocks in Berkshire Hathaway's portfolio, so as one of the smallest of the group, Synchrony Financial often gets overlooked. Synchrony Financial is a leading issuer of store credit cards and also has a substantial online banking operation. Now, store credit cards generally aren't great deals for consumers, often having APRs well in excess of the industry average. However, they have the makings of an excellent business. For one thing, although Synchrony's charge-off rate of nearly 6% is quite high in relation to other credit card issuers like American Express (NYSE: AXP) and Capital One (NYSE: COF), the high-APR nature of the products more than makes up for it. In fact, Synchrony's net interest margin is 15.3% after accounting for charge-offs and interest expenses. The bank's return on assets (ROA) is roughly three times the industry's 1% benchmark, and its 31% efficiency ratio is impressive even for a branchless bank. Furthermore, Synchrony took quite a hit recently after it announced that it would be losing its Walmart (NYSE: WMT) co-branding partnership. However, this is likely to be more of a temporary setback than a permanent problem. Think of it in the same context as when American Express lost its Costco (NASDAQ: COST) partnership; a few years later, the lost revenue has been made up for and more. With great management and a solid plan for growth, I suspect the same will happen here. Tyler Crowe (Berkshire Hathaway): There are lots of stocks in the Berkshire portfolio that are worth owning on their own, but I think that investors would be missing the forest for the trees if they didn't consider putting that money into the entirety of Berkshire's stock holdings rather than trying to cherry-pick one or two of them. To me, there are three reasons why investors should seriously consider buying Berkshire Hathaway right now. It's so much more than just its stock holdings: As of the company's most recent quarterly filings, Berkshire's portfolio of stocks had a market value of around $190 billion. No doubt that is immense, but Berkshire's total assets are valued at $711 billion and include some of the nation's largest railroads, electric utilities, and insurance companies. Those operating businesses are the ones that generate the mountains of cash that Buffett and Charlie Munger have deployed into equities over the years. It's a great capital allocator with lots of cash: I dare you to find a better tandem of capital allocators to give $111 billion in cash and equivalents than Buffett and Munger...I'll wait. Shares are pretty cheap right now: Shares of Berkshire are up an impressive 19% over the past year, but the stock still looks relatively cheap all things considered. Shares are at 1.46 times book value. That is above the 1.2 times threshold that Buffett used to use as a gauge for when to buy back stock, but keep in mind that $111 billion of that book value is in cash. The underlying assets of the business are valued for less than that. Buffett and his lieutenants picked all the stocks in its portfolio for a reason, so why try to beat them when you can join them? With management hinting that it will buy back shares, it would appear that it is a good time to buy Berkshire's stock.